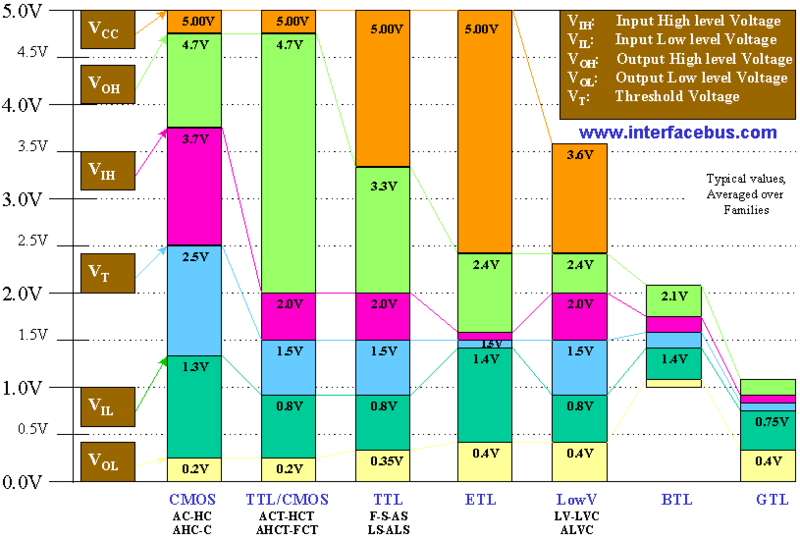 The voltages of the signals in most 5V logic systems is based on the TTL logic levels. As most microprocessor systems used 74xxx or 74LSxxx or related series chips for at least some functions. Hence when NMOS chips replaced the bipolar transistor logic chips, the NMOS chips were designed to be compatible with TTL logic levels. Later on, as CMOS memory chips were designed, again a lot of these were designed to interface to microprocessors. So it was logical for CMOS microprocessors and other support chips to again be designed to be compatible with TTL logic levels when operated on a 5V supply. Note however that the CMOS chips output drivers (output pins) can drive the output much closer to the +5V supply compared to the figure shown in the diagram below. Also the input switching levels may not be exactly the same as in the diagram below. Always refer to the relevant datasheet for the chips you are using. For a "Complete BBC Games Archive" visit www.bbcmicro.co.uk NOW! So it was logical for CMOS microprocessors and other support chips to again be designed to be compatible with TTL logic levels when operated on a 5V supply. It might be helpful to make a distinction between the 74HC and 74HCT ranges of CMOS logic chips; the former do not have TTL-compatible input thresholds whereas the latter do. The 4000-series CMOS logic devices don't have TTL-compatible inputs either. Yes, I often find that useful, although it misses the fact the SOME low voltage systems are 5v tolerant on input. For example, I'm curently using some 3v LVC buffers and sticking 5v into them which is OK according to the device's datasheet. Yeah, but CPU clock signals rarely are to TTL levels. For example, apart from 65C02 and 65816 CPUs, the original NMOS Z80 CPUs need a logic high on their clock input pins that is higher than the typical TTL gate (74xxx or 74LSxxx) can manage. And all clock signals normally have to have relatively fast rise and fall times. I know, its just another thing that needs to go on the list of gotchas with logic levels, along with the "compatible" LVCMOS and LVTTL levels popular on some FPGAs. On the 65* NMOS processors it is fall time rather than rise time that's the killer, the original 6502 could tolerate (and generated) slow to rise clocks. The 65816 and 65c02 are very picky though and seem to (un)happily clock away on noise on a rising edge whilst ignoring any signals that don't go reliably and quickly to over 3.5V then seemingly work fine on out of spec signals for days. I have to admit having originally mis-read the spec for the w65c02 which has two sets of figures in the same row for two different sets of signals. checking out the clock into a XC9500XL which is 5v tolerant. on the high BW 'scope). fall. Any longer than that and the system starts glitching quite badly. the supply droop and changes the threshold causing multiple triggers. going to have to put it through a Schmitt buffer to clean it up. Any longer than that and the system starts glitching quite badly. Maybe a little off topic but i'm struggling with a XC9572XL driven by a DIL oscillator but after some time the CPLD freezes. The oscillator is powered with 5V, the CPLD with 3V3. Last edited by bprosman on Wed Nov 14, 2018 8:30 pm, edited 1 time in total. applying any 5v IO signals or it will nuke itself. Think I nailed it, put an extra (10uF Tantalium) capacitor on the power line and a 1K resistor in series with the clock signal. Its running now already for more than 15 hours without freezing.